Last December, co-directors Tom Tykwer and Andy and Lana Wachowski had Empire photograph them standing amid a collection of props as a way of saying, "Look, we're actually making a movie based on Cloud Atlas, so shut up." The proof that the team really had tackled David Mitchell's complex, interlocking narrative—which follows a multitude of characters across various century-spanning timelines through several genre styles—was followed by yesterday's confirmation that the completed project would actually screen at the Toronto International Film Festival, finally allowing everyone to decide whether Cloud Atlas will go down as an admirably ambitious triumph or mess. But before that happens and ruins all the fun, here are a couple of other things to inspire the passing of premature judgment: Entertainment Weekly has posted two photos of some of the sprawling, all-star Cloud Atlas cast, giving you the first glimpse of what they'll look like in character. 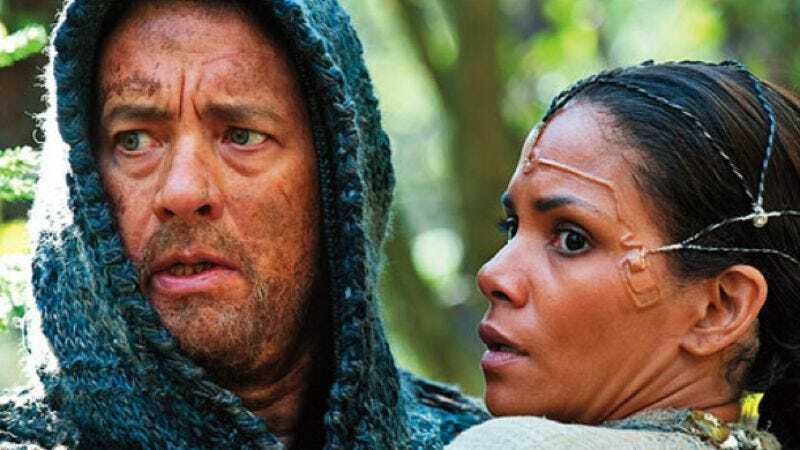 Above are Tom Hanks and Halle Berry, presumably in scenes drawn from the book's final chapter, in which Hanks' post-apocalyptic Hawaiian tribesman is visited by Halle Berry's technologically advanced emissary, which you can gather from the Hanks' drug rug and general dirtiness and the weird wires and things implanted in Berry's face. Below are Jim Broadbent and Ben Whishaw as, respectively, an eccentric, early 20th-century composer and the musician drafted to be his assistant, as you can maybe tell from Broadbent's crazy Cosby robe and the way they appear to be glaring at sheet music. So again, Cloud Atlas: actually a movie.